What's your going out ritual? Come on. Everyone has one. Some people take a shower while hollering out their favorite songs off key. Others might meet up with friends at their house while unwinding with a light meal and trading stories about the week. And then there are those who are a little more out of the ordinary. Some people amp themselves up for a memorable night by doing lunges around the house to the sweet harmony of Queen. Others might step onto their deck and howl at the moon. Whatever your ritual is, you do you! This hat is the perfect way to top off any classy zombie or witch doctor look. 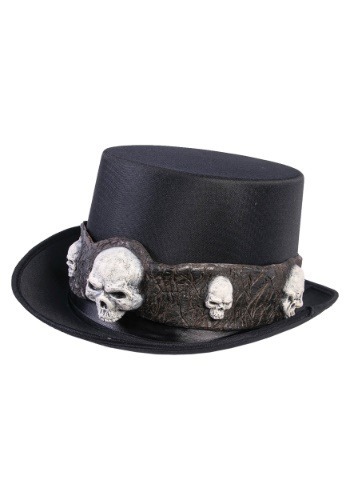 The skulls around the brim accent the dapper hat so that you can stay looking professional while getting some undead cred. And hey, when you're looking to wear a plain black hat, you can always detach the skull band to wear with Zoot suits and waistcoats. Honestly, we think that the more strange your ritual is the more interesting your night is going to be. Whether you've got a ceremony down pat before you head out for this years Halloween party or you're planning on winging it, you're sure to have an interesting night when you're wearing this ritualistic looking hat!